At the beginning of the 19th century Liverpool was the main port used by those wanting to travel to the United States. As well as English immigrants, virtually all those from Ireland sailed from this port. So also did large numbers from Germany, Sweden and Norway. It is estimated that around a half of all Europe's emigrants went via Liverpool. In 1830 an estimated 15,000 emigrants went from Liverpool. This increased to over 50,000 in 1842. 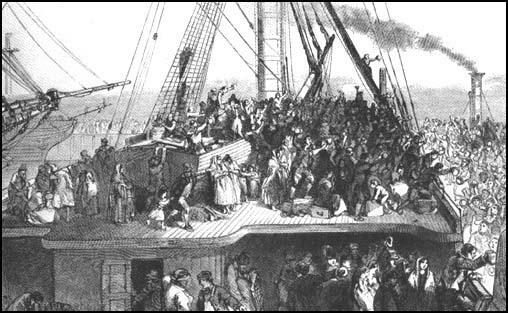 By the middle of the 19th century an average of 200,000 emigrants a year were leaving from Liverpool. This was more than half of all emigrants to America. However, as the century progressed, German ports such as Bremen and Hamburg became more important, as they were geographically better placed to cater for the growing number of emigrants from central and eastern Europe. The beginning of the 20th century saw a surge in the number of people wishing to leave Europe. Italy was now the main source of emigrants wishing to go to America. In 1907, a record 1,285,000 people arrived in the United States. Just under 60 per cent of these people came from just four ports. Naples in Italy led with 240,000 (Italians, Greeks and Turks). Bremen in Germany came next with 203,000 (Germans, Poles, Czechs and Hungarians). Liverpool was in third place with 177,000 (British, Irish) and Hamburg fourth with 142,000 (Germans, Russians, Scandinavians). Here are women with swollen eyes, who have just parted with near and dear ones, perhaps never to meet again, and mothers seeking to hush their wailing babes. In one place sits an aged woman listless and sad, scarcely conscious of the bustle and confusion around her. The voyage across the Atlantic is another dreary chapter in an existence made up of periods of strife with hard adversities. (2) The Morning Chronicle reported the start of the maiden voyage of Star of the West from Liverpool to New York in 1850. Of the 385 passengers, 360 of them came from Ireland (15th July, 1850). Many had to toss their luggage on board from the quay, and to clamber on board by the rigging. The men contrived to jump on board with comparative ease; but by belated women, of whom there were nearly a score, the feat was not accomplished without much screaming and hesitation. Here and there a woman becoming entangled, her drapery sadly discomposed, and her legs still more sadly exposed to the loiterers on shore, might be heard imploring aid from the sailors or passengers above. Many a package missed its mark and fell into the dock, where it was rescued and handled up by a man in a small boat who followed in the wake of the mighty ship. When at last the ship cleared the gate and floated right out into the Mersey the spectators on shore took off their hats and cheered lustily, and the cheer was repeated by the whole body of emigrants on deck, who raised a shout that must have been heard at the distance of a mile in the noisy and busy thoroughfares of Liverpool.